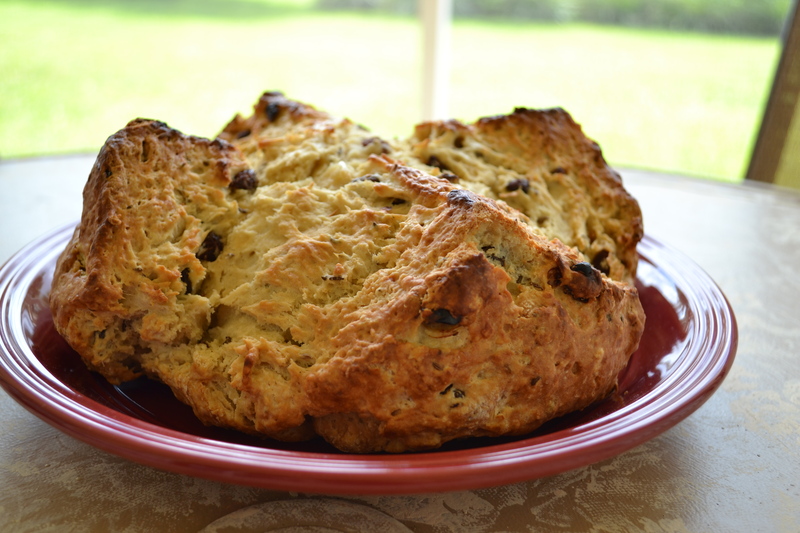 I never grew up eating Irish Soda Bread, but I became very familiar with it during my stint at Cambridge Cafe in Maine. We wanted to sell Irish Soda Bread for custom orders, and I was asked to make a few different samples so that we could decide what to sell. I made traditional with raisins and caraway, very untraditional with beer and cheddar cheese, and whole lot of in between. We ultimately decided on the traditional loaf, with raisins and caraway, because it was so darn good. People recognized it from a mile away, and enjoyed our samples so much, I ended up making about 50 loaves that holiday! 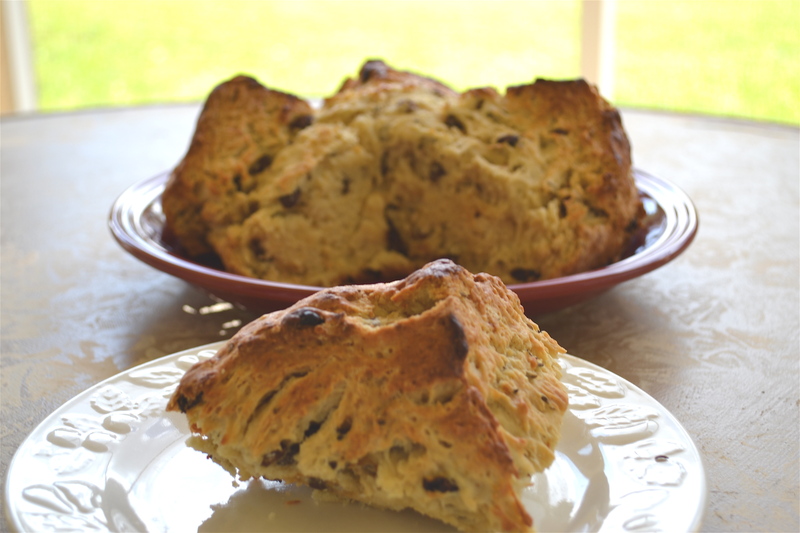 Irish Soda Bread is a “poor man’s bread” and uses very basic ingredients and cooked in a griddle pan instead of with fancy equipment. It has a similar texture and taste to a scone, with a crunchy crust and soft interior. They both use buttermilk as a leavening and acidic ingredient, giving them that wonderful tangy taste. Soda Bread is shaped into a large ball and an “X” is cut into it before baking so that it has four giant segments after it has cooked. Historically this was done to ward off the devil; today I’ve done it so that it’s easy to pull apart and serve around the table. It dries out rather quickly, so you are best eating it hot out of the oven or within two days of baking. I like it the most served warm with butter. You can have it for a lovely breakfast or traditional side dish for your St. Patrick’s Day dinner. Whisk 4 cups flour, sugar, salt, and baking soda together in a large bowl. Use a pastry cutter or your fingers to break the butter into the flour mix, breaking the butter into pea-sized pieces and mixing it with your hands until it resembles coarse sand. Add the raisins and caraway seeds and mix. Make a well in the center of the flour in the bowl. Add the egg and buttermilk to the center and stir with a wooden spoon until it’s too stiff to stir. Move the dough into a lightly floured surface. Lightly knead the dough into a ball, adding the additional 1/2 cup flour if it’s too wet to knead. It should be slightly sticky, but better slightly sticky than over kneaded. Put the dough into a greased cast iron skillet or oven safe pan. Use a serrated knife to cut an “X” halfway through the dough. (For an example, click here) Brush the top with the 1/3 cup milk. Bake for 35-45 minutes, or when a skewer comes out clean from the center of the bread. If it turns brown too quickly, cover with foil so that the inside can bake without the top burning. Remove from the pan and let it sit for 5-10 minutes before serving hot with butter.